Provisional ballots in HD-100’s race – Bill Nooney v Democrat Willis Curdy could bring the final count in that race (currently 2195 Nooney – 2162 Curdy) into Curdy’s favor. 868 provisional ballots, to be counted on Monday, may hold those votes. In Laurel, HD-59 “Doc” Woerner is down by 22 votes to Krayton Kerns (Republican). The less-than-1%-spread there means a recount is likely. A bit of trivia here – which you will get out of that link – is that Kerns took his seat only after a recount in 2006. Gov. Schweitzer: crazy like a fox? At first I was shocked to see the Good Gov telling the NRA-loving gun crowd to vote for Libertarian Bob Barr in the presidential election. Has Schweitzer lost his marbles? But strategically, I guess it makes sense. If one assumes that the folks who make gun rights their number one issue would probably vote for McCain over Obama, then pushing those voters into the Barr camp is a shrewd move. It’s a bit of a gamble but the governor isn’t known as much of a gambler when it comes to electoral politics. He might even have a poll out there that indicates how gun fanatics are going to vote in November. So, I’m with the governor on this one: if nothing is more important to you than gun rights, and you’re leaning McCain, you should really vote for Barr. Bill Vaughn, Dark Acres author and perhaps incumbent Bill Nooney’s biggest detractor, has the story on last night’s Missoula Democratic Central Committee vote. And that’s the nice stuff. You’ll have to scroll down past the first piece at Vaughn’s site to find the whole post on Curdy and Nooney. A couple of folks emailed to say that Holly Raser’s letter to the Missoulian about Republican candidate Will Deschamps was right on. They hoped that everyone had read it. Maybe I can help. It’s reprinted below the fold. Gary Brown, Democratic primary winner of HD-100’s race has made the tough decision to withdraw his candidacy due to health concerns. He and his family are in our thoughts and prayers. As Pete noted in his most recent post, the Missoula County Democrats Central Committee will be meeting next Tuesday, August 12th (7:00 p.m., City Council Chambers on Pine Street) to select the replacement to run against Bill Nooney. And frequent readers of this site know that we really would love to show Nooney the door – the exit door – from the state legislature. Curdy’s got the backing of Missoula’s Senators Dave Wanzenried and Carol Williams, along with Representatives Tim Furey and Robin Hamilton. Fine, get-‘er-done Democrats. In their letter to Jim Dayton, Chair of the Missoula County Democrats, they noted that August 19th is the deadline to name a replacement, and announcing Brown’s replacement is important to maintain momentum. As a long-time resident and property-owner in the district who campaigned vigorously during the just-concluded primary, Mr. Curdy knows the district and understands the commitment and resources required to win in November. Yep, living in your district should be a requirement…shouldn’t it? I like Curdy – not that I didn’t like Brown – but I liked Curdy because of his wide background: a 30-year high school teacher (who could endure that long?! ), a Bitterroot Hotshot and a Missoula Smokejumper (talk about demonstrating both teamwork and leadership! ), and (and!) a USFS pilot (stress management, anyone?). There’s more – trustee on both the Missoula Rural Fire District and the Big Flat Irrigation District (ever had to work with irrigators? )…..Lot’s of great qualities in there to help bring the legislature closer to getting done the huge amounts of work it needs to do. And voters sure need to consider electing candidates that can work together and get stuff done. We certainly don’t need a repeat of 2007, and it is important to ensure a Democratic majority in the state’s House of Representatives. Don’t believe me? The 2007 legislature was a disaster for the stuff that never even made it out of committee, due to the roadblocks thrown up by the state’s republicans. The list is significantly longer for stuff that didn’t make it out of committee than stuff that did. And then there’s be the party-line vote for the stuff that did…Yoy, what a disaster. And in reality, it’s sad. Because, in the end, it’s the citizens that suffer. I mean – stuff like bills to study a problem (example: public access from county bridges) couldn’t even make it. Then there’s the stuff associated with some of my favorite subjects: water quality, water rights, zoning and subdivision, fire protection. I won’t rehash all the gory details: Go search the 2007 legislative bills and see for yourself. Running for public office is one of the highest forms of community service. Thank you, Gary, for throwing your hat in the ring. Our thoughts are with you and your family. This just in, though: there seems to be a bum’s rush to appoint Willis Curdy to the position. Willis is the candidate who lost to Brown in the primary (albeit by about 70 votes). While I appreciate Missoula Democratic leadership and others for advancing a candidate — please hold on, Bill Vaughn and area legislators — it’s not your call. Let’s see what happens at the meeting. Rep. Rehberg is headed back to D.C. during the break because he, and other Republicans, are outraged over the high price of gas. His service to date is what helped get us to $4-a gallon-gas. Rehberg has supported the Cheney/Bush energy policy from day one: big tax breaks for big oil, “no” to alternative energy or transportation; and he’s accepted large contribitions from the oil, gas and coal industry. This is GOP theatrics at its best. Last night, I ate two tacos, two vikings, a corndog, corn-on-the-cob, a tater pig and fry bread — I’m slacking — must be getting old. Some people hate the fair and some people love it. I love it. It is the quintessential Western Montana experience — the people watching is the best — the pigs, goats and other livestock aren’t bad either. It’s too bad about the horse racing but still worth the price of admission. An email from a reliable friend tells me that Gary Brown, opponent to Bill Nooney in House District 100, has withdrawn due to medical issues. I certainly wish the best to Gary and his family. Health should be foremost. This means E. Willis Curdy will likely pick up the challenge. Curdy was Brown’s opponent in the Democratic primary, Brown besting Curdy by less than 70 votes. More in the future – in the meantime, good, positive thoughts for Gary and his family. The polls close in South Dakota at 7 p.m. (that’s 6 p.m. Montana time). Our polls stay open until 8 p.m.
Montana has the final word in this country’s presidential primary election season. Montana is rivaled only by Iowa and New Hampshire in the number of visits by presidential candidates and their retinues. Are we becoming jaded? Montana, which is usually considered a wasteland on the national political scene, will be sending a final message to the rest of the country: here’s who we think will be the best (Democratic) presidential candidate. If Obama beats Clinton by 20 points, as predicted, it sort of puts the race issue to bed. I mean, it doesn’t get much whiter than Montana. If Hillary can make a run at Barack’s lead and pick up more delegates than expected here in Montana, she’ll have additional ammunition to keep her plugging away right up to the convention. All eyes are on Montana. There are some great Democratic primary contests in Montana and Missoula. Statewide, there’s a race for Montana’s lone U.S. House of Representatives seat, a contested governors race, a three-way attorney general race, four-way superintendent of public instruction contest, a PSC race in Eastern Montana, and a herd of legislative contests. 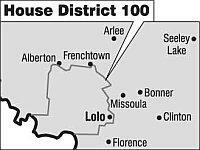 In Missoula of interest: the Rosie Buzzas/Ron Erickson Senate District 47 race, the House District 100 primary between Gary Brown and Willis Curdy, and a couple of races where sitting legislators are being challenged (incumbent Michele Reinhart v. James Boone in HD 97, and incumbent Tim Furey against Dustin Hankinson in HD 91). And we have an important Missoula County Commissioner race with three in the Democratic primary: Dennis Daneke, Jeff Patterson and Michele Landquist. Out of the area but close to our hearts is the Helena primary between Christine Kaufmann and Hal Jacobson (SD 41), and Paul Clark and Judy Stang (SD 7, which is made up of a huge slice of Western Montana). I, and I hope, others will be posting returns and comments on election night. There are events planned for Obama (the Wilma Theater), a Forward Montana gig at the Badlander, election returns at the courthouse, happenings at the Union and Missoula Clubs, and the Clinton camp is doing something at the Shack. Not sure where the Republicans are gathering (yawn). New voters will be turning out in huge numbers. On the coattails of the presidential primary, and with the incumbent governor and senator looking unbeatable, and with many strong down-ticket races — it doesn’t get much better than this for Montana Democrats.